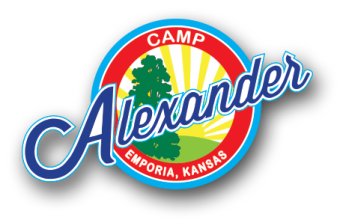 Camper registration is meant for children 6-12 years of age who wish to partake in any of the week long summer camps that Camp Alexander offers. Please fill out the Registration, Shooting Sports Waiver and Health Form and send them to Camp Alexander (campers who attended the previous summer do not need to complete the health form). A scholarship application for camp fee support is available on our Scholarships page. *MULTI-CHILD DISCOUNT: Families will receive a $10 discount per child when registering two or more children for the same week of camp (i.e. if three children are registered for the same week, the rate for each child would drop from $90, to $80 for that week). If emailing electronic copy, fill out credit card information on application. If mailing, send check with application. Take application to Non-Profit Solutions at 618 Commercial Street, Emporia, KS and pay by cash, card, or check. L-CAT: Camp Alexander is pleased to announce L-Cat will be providing transportation to and from camp this year. The cost for this service will be $1.50 one way and $3.00 round-trip. Those interested in taking advantage of this service will need to contact L-Cat directly to arrange pick up and drop off locations at 620-343-4207. Additional information about L-Cat and their services can be found at their website. Limited availability for each week. Open document and SAVE to YOUR computer FIRST. Then complete the saved copy on your computer. Either print and mail document to Camp Alexander, c/o Camp Registrations, 1783 Road P5, Emporia, KS 66801, or email an electronic copy to: [email protected].